80% of the cars use the exit lane as designed to get to the off-ramp. No problems. In fact, the design is great in that it allows cars to get off the freeway. 5% of the cars might not have realized the lane was exit only. I'm mostly okay with this situation, as long as they attempt to move into a regular lane right as the exit lane is indicated by the thicker lane dividers. 15% of the cars are taking advantage of the lane to get ahead. These are the ones that irritate me. They often cut in at the very last second. As long as there is enough space for them to poke the hood of their car in, they'll cut into my lane forcing me to hit the brakes. If necessary, they'll block the traffic behind them as well and rarely do they signal. 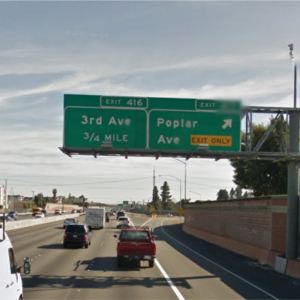 The history on this segment of 101 in San Francisco is that most, if not all, exits had a standard off-ramp constructed off the right-most lane. The idea is to add a new lane connecting the previous on-ramp with the next off ramp. In this setup, cars entering the freeway have additional space to speed up before merging with traffic. Additionally, cars exiting the highway can move to the exit only lane and slow down without blocking traffic. The overall goal is to ease congestion at the on and off ramps. However, each driver that decide to use the exit ramp to avoid traffic slows down traffic by forcing all the cars to brake as they force their car into small gaps. This is just one aspect of commuting through traffic to work that I hate! It makes me want to start biking to work again to avoid the freeway traffic. How often does this happen during your commute? Is it a ticket-able offense?